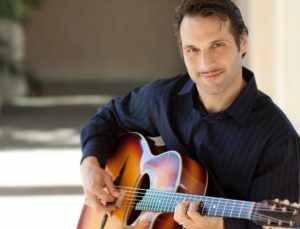 In this episode of Confetti Park, we hear some memories of a musical childhood from New Orleans-based gypsy guitarist Daniele Spadavecchia, who grew up in Italy. Daniele loves to play acoustic gypsy jazz guitar, and when he first came to New Orleans (around 2003) he hooked up with Tony Green, another musician who shares sensibility and appreciation of gypsy jazz, swing, Mediterranean Flamenco, and European ethnic music. Daniele has performed at dozens of festivals and venues in Italy and the United States, especially around New Orleans and San Diego (where he lived after Hurricane Katrina for a time). Today, you can catch him at the Tasting Room on Magazine Street, where he has weekly gigs. In this interview, Daniele describes his childhood as freewheeling and adventurous, and his parents—”an Italian version of hippies”—shared their musical tastes with Daniele and his brother.